BDI Security Solutions has installed access control equipment from ACT Vanderbilt at sites in the UK for car manufacturer Toyota Motor Manufacturing (UK). The project saw ACT Vanderbilt developers create a tailored solution after their closest competitor proved unable to operate from a virtual environment and respond promptly to client requests. Toyota’s Burnaston production process begins with the pressing of panels from flat steel on presses ranging up to 3 000 tons and proceeds to welding, painting, addition of plastic moulding components and assembly. The company uses the Kaizen continuous improvement method to optimise quality and efficiency through constant incremental changes. 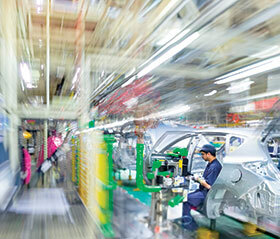 At Deeside, Toyota operates a 115-acre engine plant. Together, the two sites represent investment of £2.5bn and employ 3 000 people. The ACT Vanderbilt installation has replaced a legacy system that was no longer future-proof and did not allow access control listings to be integrated with Toyota’s general corporate database. The client now has a unified solution with badge-printing as an integral and cost-effective element when it had previously been a separate process. The equipment includes ACTpro Mifare1030 mullion proximity readers at both indoor and outdoor locations. These slim-line readers support third-party smart cards and fobs, feature a robust polycarbonate housing and have an ingress rating of IP67. They are particularly suited to this type of project where the smart card is used for multiple applications across access control and HR. In order to maximise use of budget and observe the client’s stringent environmental policy, a number of fit-for-purpose legacy Mifare readers were included in the new system. Toyota is also using ACT Vanderbilt’s ACTpro eLock MIFARE Classic. This is a wireless door lock that includes an access control reader and opening mechanism, all powered by batteries. eLocks operate with an ACTpro eLock hub and up to 32 locks can communicate over a wireless network with each hub. Battery life is exceptional at over 200 000 operations or an estimated three years on a busy door. There are visible and audible alerts for problems with tampering, signal strength and door status, and wireless connectivity is up to 150 metres (line of sight). The lock is available with an optional Euro-profile cylinder to provide key override.